What should be in my Grooming Kit? The equipment used to groom a donkey is designed for horses, so can be purchased from any good tack shop or saddlers. There is a wide variety available and of course a donkeys coat varies with the time of year. Most donkeys grow a thick woolly winter coat which starts to come out usually in late spring. This process takes several months and they usually look smooth and sleek for a few weeks at the beginning of August, before they start to grow their woolly coat again. Different tools are used depending on the state of their coats. For a thick woolly winter coat you will need a stiff brush such as a Dandy brush, or a metal currycomb to remove any caked on mud and dirt from the main part of the body. Use a softer brush i.e. a Body brush to clean the more tender parts of the body, such as face, legs and belly. When they are losing their coat – and it can come out in handfuls! – probably a plastic or rubber currycomb will be more effective. Donkeys love being groomed especially at this time of year. When they have a nice smooth summer coat a Body brush is best. Brush them all over, brushing the same way as the hair grows. The donkeys love it and it helps build a good bond with you and your donkey. You will also notice any minor cuts or fly bites and be able to treat them before they become a problem. 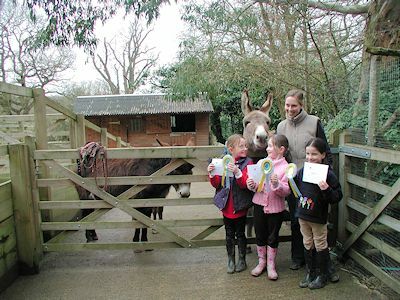 We have lots more information about how to care for your donkey and have a range of user friendly staged management awards (The DBS Proficiency Awards) for you to work towards. If you know someone in your area who might welcome help with their donkeys, please contact your Area Representative.